Roll pleat curtains is a term that may refer to one of two styles of drapes. First, “roll pleat” is often used interchangeably with “S-Fold”, “Wave” and “Ripplefold”. 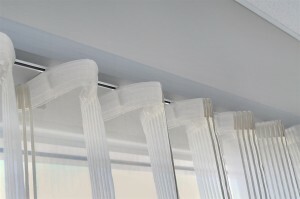 In this case, roll pleat simply refers to the flowing, “rolling” fabric of these soft-fold curtains. Second, some brands of eyelet curtains use the term “roll pleat” because the eyelets (typically meticallic rings) at the top of the curtain “roll” around the curtain rod or poll. 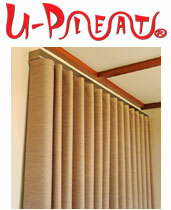 U-Pleat… a stunning alternative to roll pleat curtains. Here at Uni-Q Products in Perth, we do NOT sell the second style (eyelet curtains). Instead, we sell the first style – soft fold – in the form of U-Pleat. As you’ll discover on our website, U-Pleat curtains offer many advantages over standard Roll Pleat curtains. What’s more, you can complement U-Pleat with our half price padded pelmets for a stunning yet affordable luxury look. We’d love to talk with you about roll pleat curtains and our U-Pleat alternative. We will gladly show you how U-Pleat can benefit you – in your home or business! 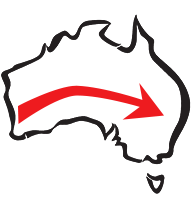 Contact us online or simply give us a call.